A few weeks ago, I instagrammed a picture of this pie with some exciting news: my boyfriend Erlend had just been accepted to one of his first choices for graduate school! I'm not sure what this acceptance means yet (that is, will we be moving to New York? ), but I will say that I'm incredibly proud of him. Since we graduated, Erlend's been struggling to find a job and career track that he's enthusiastic and passionate about. Over the last year or so, I've seen him become more and more excited about his chosen field of study, talking my ear off with crazy facts about the human body learned from books, classes and his internship at the hospital. I now know far too much about how the different muscles in different parts of your body work, believe me. Maple syrup is one of the few sweets that Erlend can actually out-eat me at (although he argues that he can out-eat me when it comes to chocolate... but yeah, no). I remember feeling a mixture of surprise, disgust and ultimately, admiration the first time I watched him pour almost an entire half of a bottle over a stack of crepes on our first brunch together. And of course, having spent most of his childhood summers and winters in Vermont, Erlend is a bit of a maple syrup snob — it's Grade B or bust. Lucky for me, his parents had just sent us a parcel containing a massive jug of Vermont maple syrup from their last winter trip there. This pie would not have been possible without it! As for the actual recipe itself, the pie comes from the Four & Twenty Blackbirds Pie Book, a cookbook full of recipes from the famed Brooklyn pie shop. According to the cookbook, the maple and lime combination was actually inspired by a salad dressing (of all things!). I must admit that, although Erlend was incredibly enthusiastic about the flavor, I was skeptical at first. Maple and lime? Really? It seemed a little too out there for me, and this was coming from somebody who's previously used beets, rosemary and saffron in various cakes. Upon first bite, however, I was convinced. 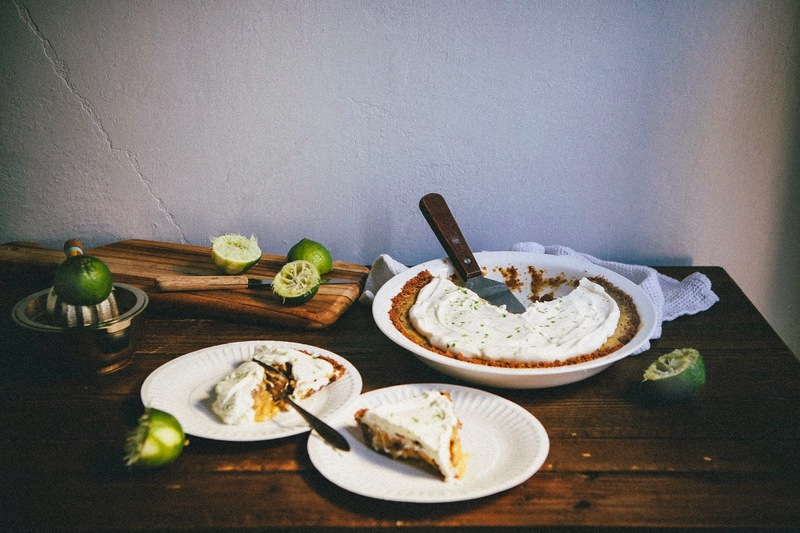 A maple custard on its own would have been far too sweet — the lime gave the custard a citrusy, tangy bite that balanced out the cloying sweetness and intensity of the Vermont maple syrup. And with regards to the rest of the pie, I basically made no alterations to the cookbook's recipe. The pecan biscotti pie crust is the bakery's take on a traditional graham cracker crust, just with crushed ladyfingers and spruced up with some pecans. The only change I made was adding an extra layer of crème fraîche whipped cream on top of the custard, which I did only because Erlend has a fondness for especially tart desserts. As I briefly mentioned above, maple syrup in the United States comes in two grades: A and B. Grade A maple syrup is thinner and has a lighter flavor. Grade B is thicker with a richer and bolder flavor. Use Grade B maple syrup if you can! It makes a big difference. In a pinch, you can substitute the crème fraîche in this recipe with sour cream. The end result might be a little bit tarter though, so feel free to add in an additional teaspoon of granulated sugar. You can make the crust a few days in advance — simply wrap the crust in plastic wrap and store in the refrigerator until you're ready to use it. That actually might be the best way to do it, since it's easier to fill the crust when it's cold. Use your hands to break 2 1/2 ounces ladyfingers into smaller pieces into the bowl of a food processor fitted with a blade attachment. Sprinkle 2 tablespoons granulated sugar and 1/4 teaspoon kosher salt over the broken pieces. Pulse in short bursts until the ladyfingers turn into fine crumbs. Add 1/2 cup pecan pieces and process until the mixture is homogenous. Add the melted butter and process until just combined. Pour the crumbs into an ungreased 9-inch pie pan. 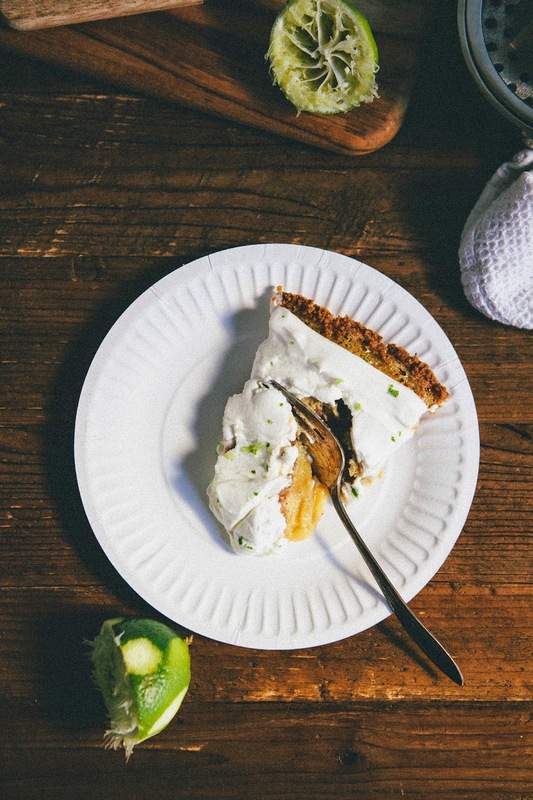 Use your hands to spread the crumbs evenly throughout the 9-inch pie pan, before using your fingers to press the crumbs evenly onto the bottom and up the sides of the pan. You can use a small shot glass or a nifty pie tamper to smooth out any bumps. Transfer the pie pan to the freezer and freeze until solid, at least 10 minutes. While the crust is freezing, center a rack in the oven and preheat to 375 (F). Once the crust is frozen and the oven is preheated, place the pie pan containing the crust on a rimmed baking sheet and bake on the center oven rack for about 14 minutes, until lightly browned. If the crust slumps or cracks while baking, you can use a kitchen towel to gently push the crumbs back into place. Cool completely on a wire rack, before refrigerating the crust for 10 minutes prior to filling to set the crumbs. First, prepare your crust by refrigerating for at least 10 minutes. Position a rack in the center of the oven and preheat to 325 (F). 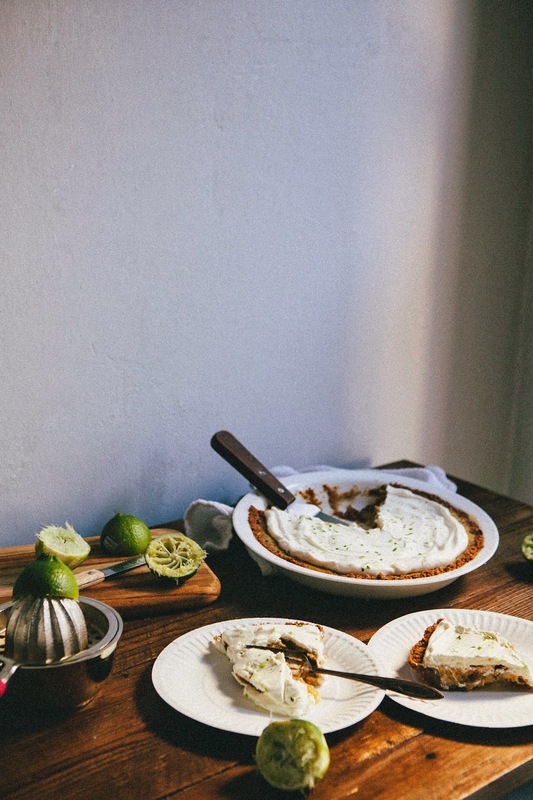 In a medium bowl, whisk together 1/2 cup sour cream, 1/4 cup granulated sugar, freshly grated zest from 1/2 lime and 1/2 teaspoon kosher salt until well combined. Whisk in 4 large eggs and 1 large egg yolk one at a time, only adding the next egg when the previous one has been fully incorporated. Whisk in 1 cup maple syrup, 1/3 cup fresh lime juice and 1/4 cup heavy cream until the mixture is homogenous. 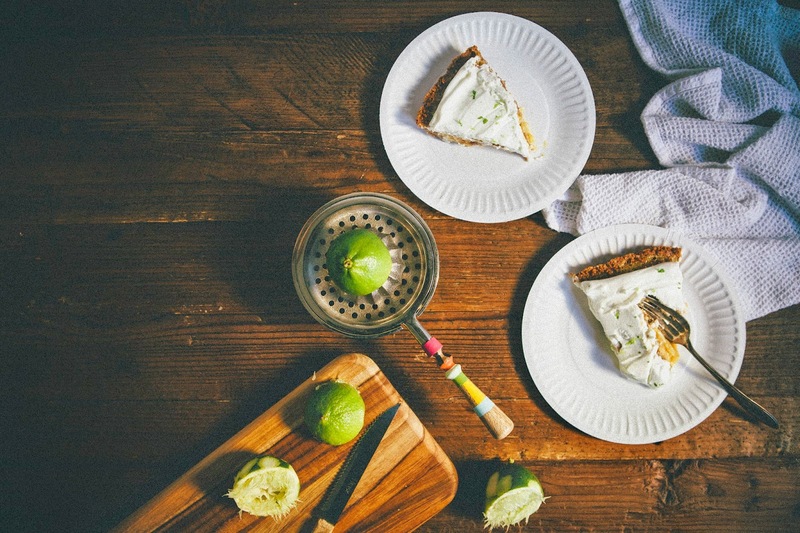 Place the chilled pie crust in the center of a rimmed baking sheet. Carefully pour the filling into the pie shell. Bake in the preheated oven for 20 minutes, before rotating the baking sheet 180 degrees and continuing to bake for another 15 to 20 minutes. The pie is finished when the edges are set and puffed slightly, and the center is no longer liquid but still wobbly. You can test this by using a butter knife to gently tap the pie plate and watching the custard. DO NOT OVERBAKE — doing so will separate the custard. The filling will continue to cook and set after the pie is removed from the oven. Allow to cool completely on a wire rack, before topping with the crème fraîche whipped cream. In the bowl of a freestanding electric mixer fitted with a paddle attachment, combine 1/4 cup heavy cream and 2 teaspoons granulated sugar. Whip on medium-high speed until soft peaks form. Use a rubber spatula to fold in 1/2 cup crème fraîche until just blended. 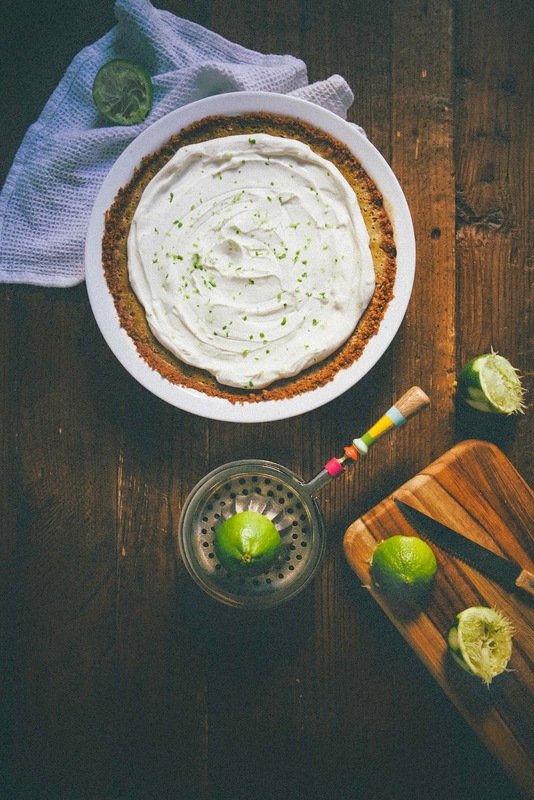 Spoon the whipped cream over the top of the pie, and garnish with fresh lime zest. Serve immediately. Michelle give him my congratulations. I know what it is like to finally find your passion in life, it took me 8 years to find out that my skill was baking rather than health science. From the crust to the creamy top this pie is a show stopper! Many congrats to your fella too! Being enthusiastic about your work is ultimately what we all want. oh boy oh boy, hugest congrats to erlend!!!! that is so exciting!!!! that would be crazy awesome if you moved to new york! this pie looks amazeballs. biscotti crust?? genius. and that juicer is the cutest juicer i've ever seen! Word. I'm still trying to figure out my passions myself, tbh. Eating + baking + photography + blogging is definitely leading to something though. Thanks for the congrats! Will pass it along. Me too, me too. When the boyf first requested it, I was like "what, ew, no." but then it won me over. It's definitely unique! Yeah, there's definitely a good chance we'll be moving tbh. I'm pretty excited — I've always wanted to live in NYC, and as much as I love PDX, it's time for a new adventure! 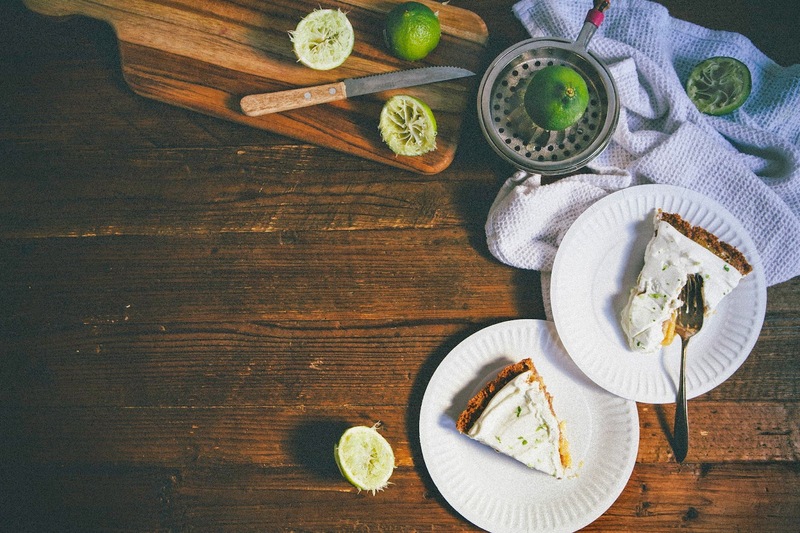 I actually think the combination of maple syrup and lime sounds so good! I immediately thought of a cocktail. But as pie?! Yum. Totally want to try this! 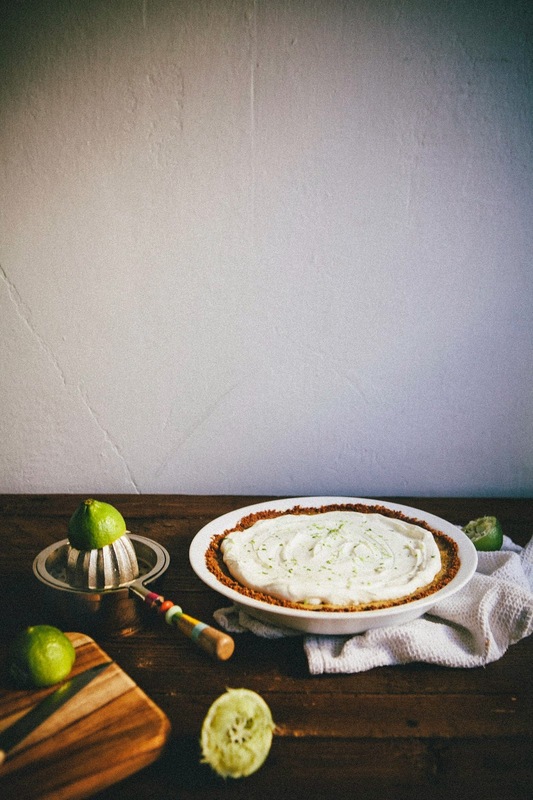 Especially since most lime pies call for condensed milk, which I can rarely find. Gorgeous pictures too! UM... So yes, move to NY!!! Congrants to Erlend!! I know firsthand what it's like to struggle with the "right" career path - I'm so happy that he found his passion! 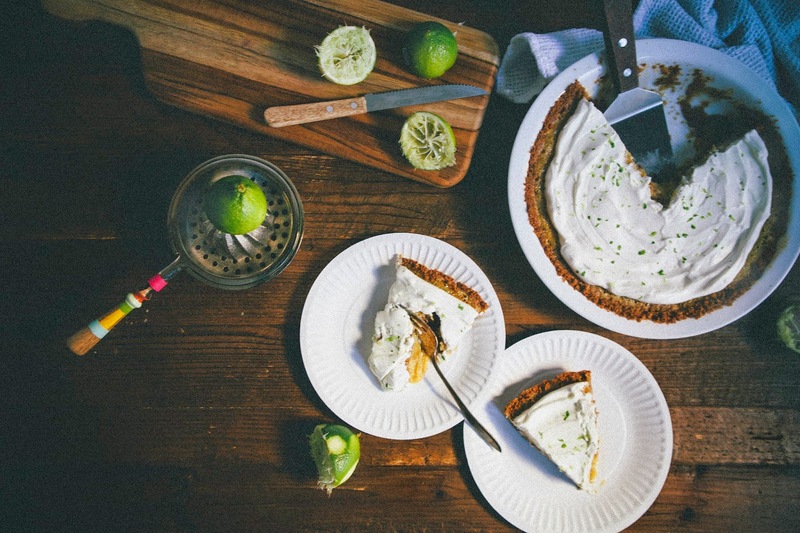 This pie looks heavenly - maple and lime!! Yum. Yay, yay, yay! Congrats, Erlend! Are the ladyfingers soft or hard? I thought ladyfingers were soft. my mind if they are soft. Sorry, I am quite the amateur cook. 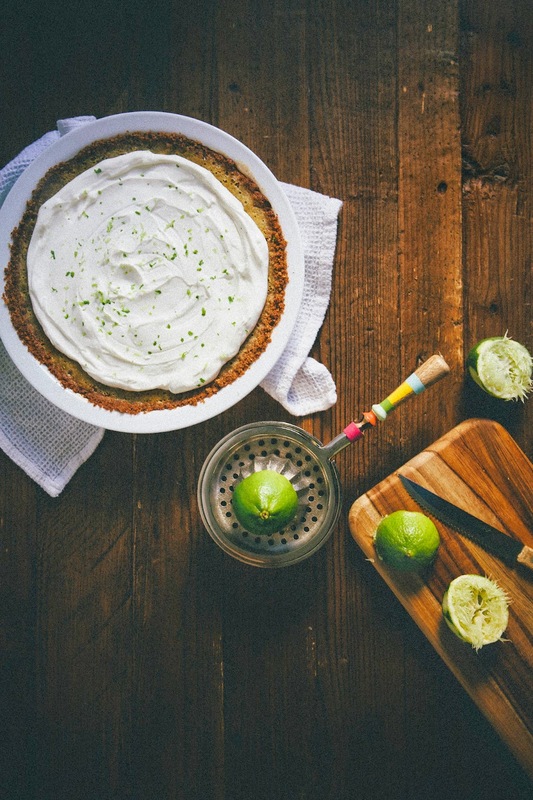 Yep, most lime pies are mostly made of sweetened condensed milk — this recipe is definitely a fun change! Where do you live? I'm curious why condensed milk isn't easily available, I thought it was everywhere! Thanks Betty! I'm pretty proud of him. And moving to NYC would be amazing, I just don't have a timeline yet... will keep everybody updated! I love, love, LOVE cheesecakes with creme fraiche on top. It's one of my favorite desserts! I actually got the idea to put this on top of the pie from a cheesecake I made a few years ago. They can be both. Fresh ones usually tend to be soft, while the packaged ones tend to be hard. I used the packaged kind that were crunchy. I imagine if you're using the fresh ones, this recipe will work best if they're a day or two stale. Thanks Katie!!! My favorite pies are the kind with cookie crusts too (because it's like 2 desserts in one (MIRITE)! But everybody still seems to love those butter crusts, darn them! Huge congrats to Erlend! It can be so hard to figure out what we want out of this crazy old thing called life so to take the first steps on that path to enjoyment + fulfillment is brilliant. As, indeed, is this pie! Thanks Kathryn!!! I'm already daydreaming about the bakery trips we could take together :-) I'm also definitely heading to London at some point during this summer (my sister's getting married in Amsterdam, so I was planning on stopping by London first), and we must definitely get together for some coffee and pastries! This is literally mouthwatering! It has fruit and maple syrup - clearly it is breakfast appropriate! And congratulations to E! Hooray for Erland but boo for you possibly moving!! That is really exciting though. Such an accomplishment. Also, what did you guys think of Kachka?? Thanks Meredith! Can't wait to go home tbh; let's catch up over coffee or tea (at Tea Bar!). You know, I'm not really a fan of Russian food, but I liked Kachka a lot! We avoided the cold section of the menu and just got all the warm things like the cheese bread and the dumplings. So thumbs up on all the hot food, no idea about the rest lol. I love everything about this pie! (but the Canadian in me especially loves the maple syrup). Here's to new adventures! This is such a beautiful tart! The rhubarb really makes it pop! Just finished making this cake! Not hard at all...only took me 2.5 hours and that was with cooling times. I improvised...had 3 6 inch Wilton pans which I used...then just took a very sharp knife and removed the browned outside edge. Worked perfectly and no piecing a layer together with crumbs. I didn't have the "ring to use as a form, but found I didn't need it and also didn't have acetate, but "borrowed" a file folder from my hubby which seemed to be the same material...worked great. Someone else suggested using a pastry bag for the icing and that was the best hint of all...just used a large plain tip and circled around the layers. My 33 year old daughter requested this cake after seeing your blog. I was happy to oblige! Thanks Caroline! I was skeptical too, but really, the citrus cuts down on the maple syrup's sweetness. Thanks Sara! 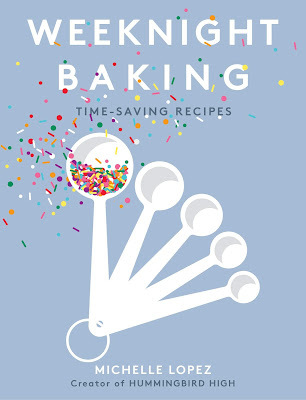 I love their cookbook! It's so inspiring! Hi, this is amazing! I made this tart and posted the recipe on my blog, and got to say that this is one of the best thing I have tried lately... Rhubarb roasted with wine OMG!! This cake is amazing! I don’t know where do you came with the idea of decorating it , but it’s perfect! Really! Hi! I'm about to make this cake and I was wondering if you soaked the top layer with the cake soak too before frosting it. 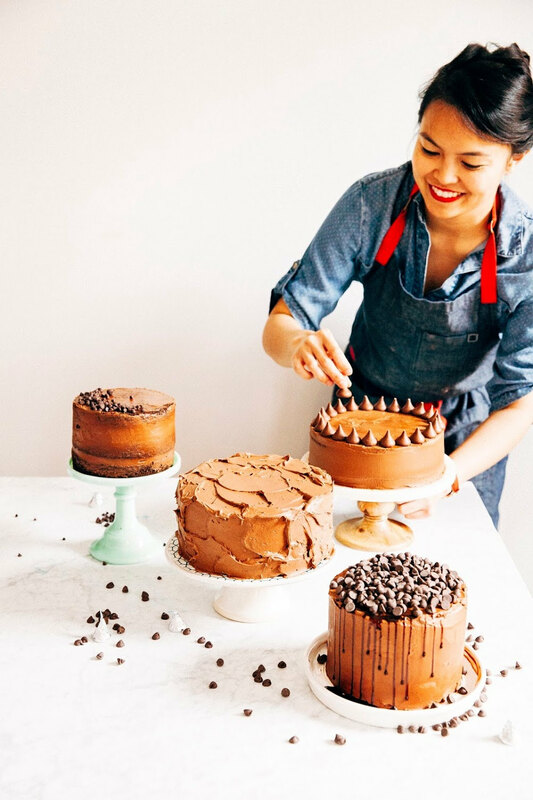 I'm planning on making this for my birthday next week, and I've been looking at a TON of blogs that have made this cake but your post is hands down the best one and most helpful I've read. Thank you so much for taking the time to take the pictures and give your advice!